That's my new office that I just moved in earlier this month. Well, part of my room to be exact. Decided to get the Matrox DualHead2Go as a office warming gift to myself. Heh. 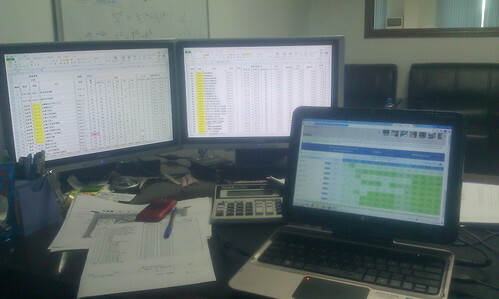 Part of my work requires a lot of cross-referencing across many spreadsheets. I used to have so much grief with Alt-Tab to switch between screens coz the spreadsheets all looked very similar and with many applications running, there are times where I have to cycle through many Alt-Tabs just to get to the one that I want. This little gadget is really a godsend for me and my money well spent. Unfortunately, the extended screens flickers quite a bit, although still manageable. I blame it on the cheapo LCD monitors that sits before me that I had to choose the analog version of the Matrox DualHead2Go. ..... and maybe a 3rd monitor to make it 4?